This is part of our In Depth series, where we highlight the activities and people behind new student groups and/or student groups that might go somewhat under-the-radar. You can read the rest here. The Wesleyan Refugee Project (WRP) was founded in the Fall of 2015 and had a very busy and successful inaugural year. I sat down with Casey Smith ’17, who helped to found WRP to find out more about their founding, what they’re working on now, and how new students can get involved. What is the Wesleyan Refugee Project? Casey Smith ’17: We are a student organization that was founded last year that works to support refugees in a few different areas. We volunteer with local and global organizations both remotely and directly, working on areas such as resettlement, legal aid and tutoring. We also fundraise for various causes related to refugee issues such as scholarships for students living in Za’atari Camp in Jordan. We advocate for greater awareness of current refugee crises. Can you say a bit more about WRP’s founding? Casey: About a year and a half ago, I was volunteering at IRIS, which is a resettlement agency in New Haven, and I knew that there was a lot of students at Wesleyan that were really interested in this type of work. So Cole Phillips ‘16 and Sophie Zinser ‘16 and I got together and set it all up to begin last fall. And then other people got involved as well. Sarah Rahman ‘16 and Emma Golub ‘16 led fundraising and tutoring programs, respectively. Then, we became an official Office of Community Service organization in the Spring. We had a lot of support from a lot of passionate students during that first year. What are the organizations that you work with and what do they do? Casey: One of the organizations that we work with is IRIS, or Integrated Refugee Immigrant Services. It’s a resettlement agency that is contracted with the US government to resettle refugees in New Haven. So they bring in refugees every year to New Haven from all over the world, including Syria, Iraq, Congo, Afghanistan, and many other places. We go twice a week and help IRIS clients fill out applications for subsidized housing and energy subsidies. IRIS is a really great organization; they do a lot in Connecticut. They have a lot of connections to the community here. And so, being involved with IRIS has really done a lot for us, and we’re always really excited to work with them. The second one is IRAP, or the International Refugee Assistance Project. It’s a legal aid organization based out of New York, Jordan, and Lebanon. We work on a project that helps individuals living in Iraq who used to work for the US government or the US military be able to document their employment so that they can access the US refugee admissions program. There’s a special program through which individuals can resettle if they had employment with the U.S. military or American organizations during the war and can document that in some way. And so, we help with that; we track down supervisors, draft emails, and draft letters to make the process easier for refugees to find these documents. And then the third organization is Paper Airplanes, which is a student-run organization based out of Carleton College. They pair college students with Syrian students, either displaced students, or students who can’t access English education in some way, and set up conversation partnerships so that the students can learn English and continue practicing the language, if that is their goal. We also support the Amal Foundation, which is working to bring scholarships to Syrian youth leaders living in Za’atari camp, so that they can attend Zarqa University in Jordan. We were able to fundraise enough to help a student attend university in Jordan starting in October. We’re excited to have that getting off the ground and, in the past 10 days, we raised $12,000 via an online fundraising platform called Launchgood to support the rest of the student’s tuition. Those are just some of the organizations that we’re most committed to. What’s your role as a student group leader? Casey: I think it’s changing. Last year, it was really collaborative and it was all very new, so we all worked really closely together. We all just did everything. And, this year, we’ve got a group of 7 new leaders who are all working on different projects. We have Julia Morrison ‘17 leading the IRIS trips, Helena Awad ‘16 leading the IRAP project, Cheryl Hagan ‘17 leading the Paper Airplanes group, Yael Fisher ‘18, Libby Salzman-Fiske ‘19, and Sahar Shaikh ‘17 working on advocacy and engagement, and Caroline Kravitz ‘19 who is our fundraising manager. It’s changing a lot, and it’s becoming even more collaborative, which is exciting, but also more structured. My role, right now, is getting everything off the ground. But I think our role, as a group of leaders, is to provide a platform for other students who are interested in this issue to do whatever it is that they want to do to advocate, fundraise, or volunteer. People come to us and ask us to host events like films screenings and other things. We’ve collaborated with Middle Eastern Perspectives, Students for Justice in Palestine, Hunger and Homelessness, the Muslim Students Association, the Bayit, International House, and other groups. All these groups have been really wonderful to work with. Our job is to make sure there is a space for students who want to advocate around refugee issues to do so. Casey: Yeah! We have a number of goals. As you probably have heard, refugees have become a really politicized issue lately. So, we want to do some advocacy leading up to the election to make sure people know what their candidates think about refugee resettlement. We need to make sure that Wesleyan students know that, when they’re voting, this is a very important foreign policy issue that we should be paying attention to. We also want to focus our fundraising more on access to education because we’re realizing more and more that, as students, one way we can make a difference is to support other students who have become refugees and cannot access education. And that’s a huge issue. We also want to keep collaborating with more student groups. I think, as a new student organization, it’s important to build those collaborations and making sure we’re working a lot with the variety of groups that exist on this campus. And, to end, how can students get involved? Casey: We’re having info sessions on Wednesday in Usdan 110 at 7pm and on Thursday in Usdan 110 at 5PM. We’re also going to be tabling in Usdan on Tuesday from 11-2 and at the Student Activities Fair on Friday from 2-5PM outside Fayerweather. We have a volunteer application due that Sunday. To volunteer, you would fill out that application and tell us what you’re interested in. We’ll get you on the right listservs and connect you with the right leaders so that you can get started with weekly volunteering, occasional volunteering, fundraising, advocacy or other projects that you want to work on. Casey: Yeah, of course! You can email me at cksmith[at]wesleyan[dot]edu if you have any questions. Or like our Facebook page (Wesleyan Refugee Project) to learn more. 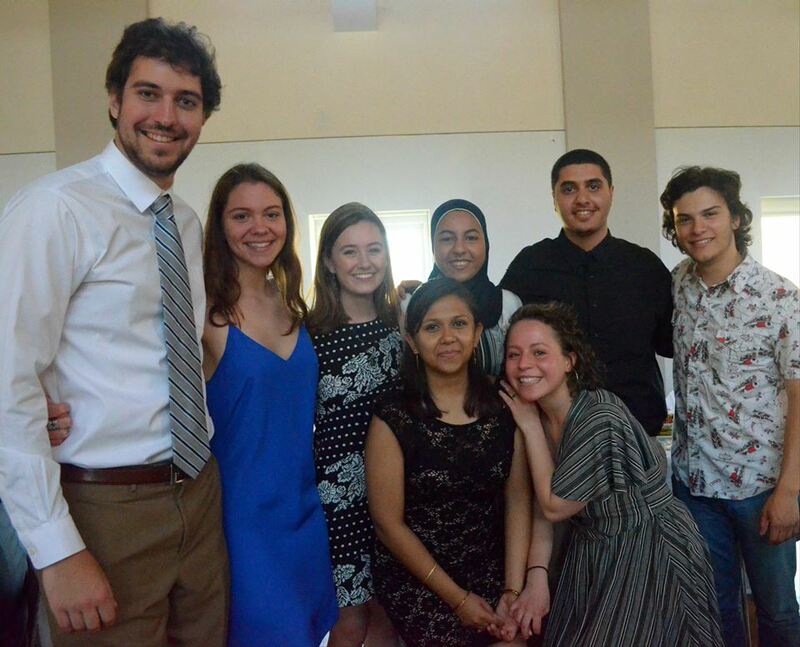 Posted by wilk in Causes, Featured, Student Groups and tagged in depth, Wesleyan Refugee Project, wesleying in depth, wrp on September 13, 2016 at 5:24 PM.